I am receiving 12 weeks of the Nutrisystem® Uniquely Yours plan for myself and my husband in return for our honest review. All opinions are 100% our own. Neal and I just completed our 4th week on the Nutrisystem program. 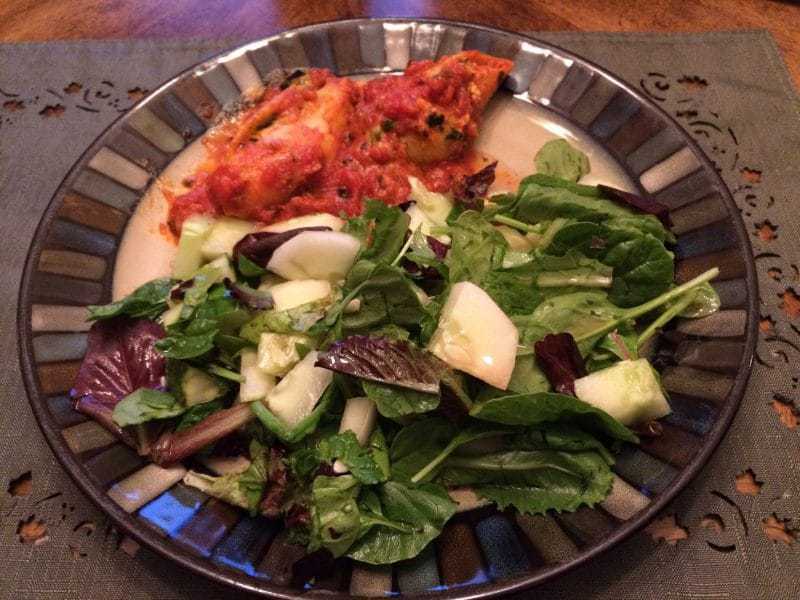 For those of you who haven't been keeping up, you can catch up by reading our weekly Nutrisystem progress posts. As you may recall, last week we didn't do so well. We both “cheated” and ended up gaining weight while we were away on vacation. After last week's disappointment at the weigh-in, we were more motivated than ever to stick to the Nutrisystem plan. This week we are back home and have followed the program religiously. As you will read, this paid off for us! 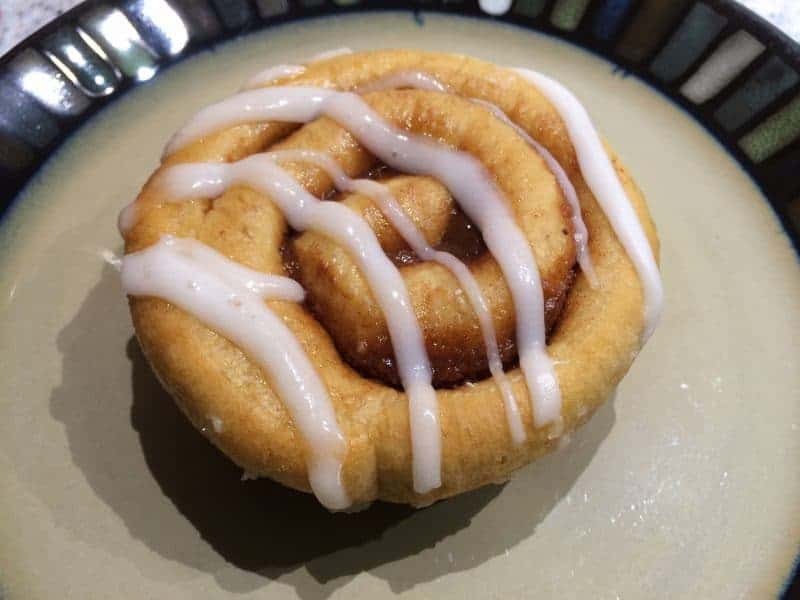 This week we enjoyed several fantastic meals and treats, such as this Nutrisystem Cinnamon Roll. I can't believe I get to eat this sweet glazed treat for breakfast – it tastes more like a dessert! Neal and I agree that this breakfast is a winner! One of my favorite dinners this week was the Stuffed Shells. The shells are stuffed with spinach, ricotta and romano. They are rich and filling, especially when paired with a nice salad. -11.2 pounds this week combined! I learned that if you follow the program as it was designed you will lose weight. If you slip up like Neal and I did last week, you will not lose weight and possibly even gain weight. This goes to show how important it is to read all the literature provided by Nutrisystem so that you can truly understand how the programs works. SmartCarbs and PowerFuels might sound confusing at first, but if you take the time to learn the program you will see that it makes sense and it WORKS! We both surpassed the “10 pounds lost” mark this week, which is worth celebrating! We also are now both past the halfway mark to our 12-week goals. This was definitely a great week! After each week on the Nutrisystem my husband and I each take turns getting on the scale. We weigh-in and compare our weight to the previous week and to our starting weight. We celebrate our scale victories, even if they are small. Any weight lost is progress in the right direction. I regret not measuring ourselves before we started on this journey so that we could realize how our bodies are changing, aside from just seeing the number drop on the scale. I feel like it is too late to start measuring in at this point since we are already a month in. My advice to anyone starting their weight loss journey would be to measure yourself each week in addition to weighing in on the scale. Some good measurement to track are waist, hips, chest, arms & legs. Even though we have not been measuring in, we still were able to determine that Neal dropped 2 inches from his waist. His pants, belt, and boxers had become so loose that he had to continually pull them up throughout the day or they would end up around his ankles. He had dropped from a 36″ waist to a 34″ waist, so newly sized belts and jeans were in order. We went on a little shopping spree and Neal came home with 2 new pairs of jeans, 2 new belts, 6 pairs of new boxers, and a new shirt. It isn't often that hubby is the one who goes on a shopping spree, but it was necessary and I think that he enjoyed it. I know one thing for sure, he deserved it! As our first 4-week program came to a close, our new shipment of food arrived. The coolest part about the Nutrisystem Uniquely Yours program is that you get to select which meals and snacks that you want to order. The first 4-week shipment was a pre-selected selection of “favorites” which allowed us to sample different meals. Then, for this next shipment, Neal and I sat down together and selected what we wanted to order. We had such a blast selecting foods from the Nutrisystem menu, and are excited to start enjoying this week. Onward to week 5! Lookout for next week's post to keep up with our progress! To find out more about Nutrisystem visit the Nutrisystem website or connect with Nutrisystem on Facebook, Twitter, Instagram, or Youtube. Good luck with week 5! Sounds like you guys are having fun doing this. And that has got to help keep you on path. Thanks for keeping us updated and letting us follow you on this journey! I’m glad you both splurged while on vacation. Then came back and got into the program again. WOW!! You are halfway there…congrats! All of the food I have been seeing looks really delicious & satisfying. I wouldn’t mind going on this Nutrisystem journey myself! Looks so yummy!!! Good luck on week 5!! WTG! You guys are doing great. The cinnamon bun looks fantastic. Congratulations on your weight loss. The food looks great. I hope you both make it. Sometimes you have to cheat. (Making Progress with Nutrisystem (Week 5) Sounds like you have been doing a great job so far with your weight loss progress. Good luck and keep her going! I have eaten some of the nutrisystem food and it not bad. Good luck with your weight loss. If I could afford this I would do it in a heartbeat! I have checked website a few times. Although, just walking .33 of a mile daily I am down 14lbs in 3 months. I’ve always wondered if this system truly worked and if in the long run it is worlth it. I wondered whether this is a lifetime commitment or if you can eventually go off of it without gaining the wieght back. There is also the cost factor. Congrats, keep up the hard work. I glad that this diet is working for you.